Students at Greenfield Community College have been given an exciting opportunity as Tim Peake’s Spacecraft arrives in the region. Twenty-eight Year 9 students, along with two members of staff, were invited to a celebration morning for the arrival of the Soyuz descent module TMA-19M at the Locomotion Museum in Shildon, where they were able to see this amazing piece of space history. Durham is hosting the Samsung-sponsored Museum Group National Tour of Time Peake’s Capsule between up to January 15. 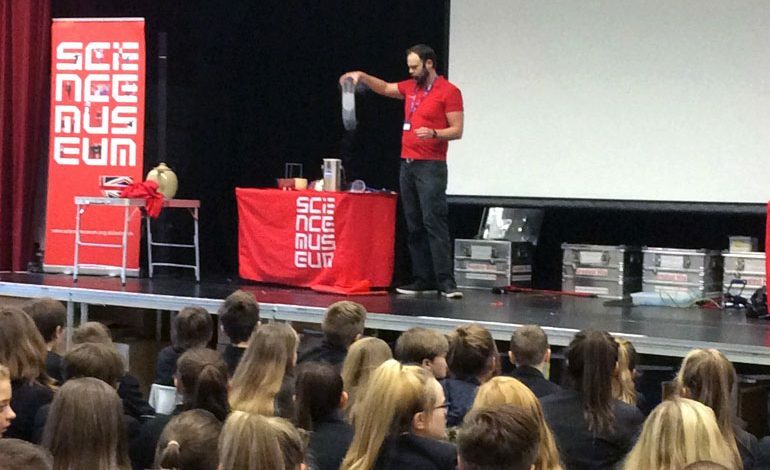 As part of the tour a team of ‘Explainers’ from the Science Museum also delivered a Science show the ‘Greatest Hits’ to the whole of Year 9 at Aycliffe Campus as part of the celebration. The students were entertained by an amazing selection of experiments which had strong links to the curriculum. The tour will also offer a further opportunity for Greenfield students to visit the National Railway Museum at Shildon to experience a 4D virtual reality experience of the descent of the Soyuz Capsule and parachute.